A UK native tree, much prized for its slender shape and characteristic white, peeling bark. Beautiful and elegant, it's no wonder that Silver Birch trees have been an inspiration to British poets and artists for centuries, and now you can grow one in your own garden! The long, slender trunks of mature trees have beautiful, white, papery bark with dark cracks running through it, contrasting beautifully with its deep-green, triangular leaves, that droop down from attractive twigs. In autumn, the leaves turn a brilliant golden-yellow colour, before falling just before winter sets in. 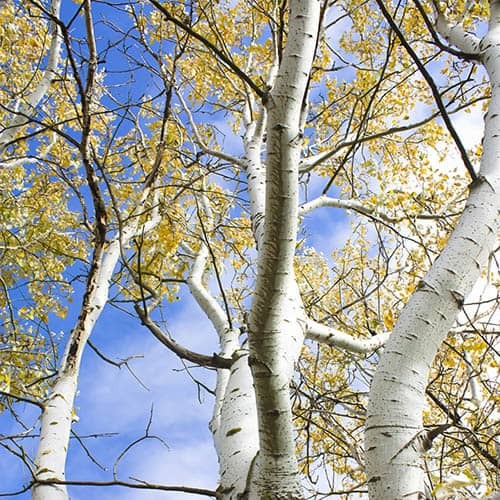 Preferring acidic soils, Silver Birch will however grow in all conditions, and provide you with year-round interest for many years to come. Perfect for planting right now, we supply a 1-1.2m bare-root tree which will ultimately reach around 5m tall. Please note that the silver colour will develop as the tree ages and the bark begins to peel. Supplied as a 1-1.2m bare-root tree which will ultimately reach around 5m tall. Add mycorrhizal fungi to the planting hole to help your new tree establish quicker. Birches will grow best in an open sunny site is most soil types. When planting, dig a hole 60cm x 60cm deep (2 x 2 ft) and incorporate some organic matter. Remove the tree from its pot and plant at the same level. Backfill around the tree and water in well. Stake young trees to prevent lopsided growth. Hard pruning is not recommended for birches, and mature trees require very little attention. When pruning is required, prune only when fully dormant from late summer to before mid-winter to prevent 'bleeding'. When young, any laterals can be removed to produce a clear trunk, along with any dead, diseased or damaged branches.